A luxurious, refined and generously proportioned villa with direct access to a secluded beach. Arrival at Alati Bay is akin to being transported into a magical, privileged world: mature, shady grounds fan out around the impressively designed villa, enchanting sea views entice you to explore the beach at the bottom of the garden, and a sense of peace and well-being immediately puts you at ease. During your stay, this carefree feeling will grow, thanks in no small part to the staff, whose discreet ministrations mean you can lie back and enjoy your holiday to the full. Inside: accommodation at Alati Bay is spread over three floors. Luxuriously finished to exactingly high standards, the quality of the design, the workmanship and the materials used is evident at every turn: cool, polished concrete floors run throughout, as do light, wood-beamed ceilings; wall-length windows and sliding glass doors make the most of the ubiquitous sea views and bring in the light; beds and seating seem an organic, moulded extension of the floors and walls; furnishings, decorative elements and lighting have been carefully selected to create a coherent but eclectic whole, where contemporary elements blend harmoniously with hints of Byzantine splendour, Italian sophistication and Greek warmth. The ground floor of the property has two sections. One is given over to two lovely double bedrooms situated and accessed from either side of a large outdoor sitting area. Both feature sea views and an en-suite shower room. A separate entrance takes one into the ground floor proper and a roomy sea-view dining area, which is served, via a short corridor, by the large, superbly equipped kitchen. A second dining table here is perfect for breakfast or for communal cooking sessions. A door from the kitchen leads out to the al fresco dining area and barbecue. Back in the dining area, a door leads to the remaining ground floor sleeping quarters, comprising a children's bedroom with two bunk beds and two built-in single beds, a separate bathroom with double showers, and a smaller twin bedroom (suitable for children or a nanny) with en-suite shower room and external access. Stairs from the dining room lead up to first floor and into a gorgeous, sea-view sitting room featuring a contemporary fireplace, large sofas, and a wall-length window that brings in the splendid panoramas and the Greek sunshine. Just off the living area is a guest bathroom and a landing with access to a panoramic terrace looking out to sea. At each end of the living area is a double bedroom. Both have fabulous sea views, a dressing area with sink, a w/c and a luxuriously fitted walk-in shower. One also has its own panoramic terrace. Another flight of stairs leads from the first floor living area to the second floor, which is given over to the majestic master suite, boasting enchanting sea views, a luxurious shower, a semi-open en-suite bathroom and, the cherry on the cake, access on both sides to panoramic terraces with comfortably cushioned sitting areas. Steps from one of these terraces take one down to a path leading to the breathtaking Jacuzzi area. Outside: Alati Bay's mature gardens feature shady Mediterranean pines, cypress trees, an abundance of flowering plants and aromatic shrubs, and a series of paths linking a variety of sitting and games areas (think table tennis and a little children's play area with pirate boat). In terms of al fresco dining, pride of place is given to a large, sea-view table situated amongst the trees and served by a barbecue, a wood-fired oven and the indoor kitchen. Surrounded on three sides by the ground floor accommodation, and overlooked by the indoor dining room, is a large, sheltered sitting area with built-in cushioned sofas. A relaxing spot at any time of day, this area really comes into its own as a venue for post-prandial drinks under the stars. The two most well-trodden paths winding through the gardens lead in one direction to a seductive sea-view Jacuzzi and in another to the bottom of the garden from where you may access a little white pebble beach and the limpid waters of the Ionian Sea. Alati Bay comes with its own mooring buoy. If you would like to charter a boat for your week(s), our supplier will be glad to drop off a boat at the buoy each morning and collect it each evening (it is not possible to moor overnight). The buoy is slightly off shore, so a member of your group would have to swim out to bring the boat into the shallows so that everyone else can hop on board. Although Alati Bay technically sleeps 18, the maximum number of guests is limited to 14 (including children). As some of the staircases at Alati Bay do not have banisters, and bearing in mind that there are some drops around the property, toddlers and young children should be supervised at all times when exploring the grounds and the house. Please ask us for more information if you would like to know more about these aspects of the property. For guests arriving in Corfu on a morning flight, a taxi transfer from Corfu Airport to Corfu New Port and the hydrofoil crossing from Corfu New Port to Gaios on Paxos are included in the rental fee for clients staying at Alati Bay. If your flight arrives in Corfu in the afternoon/evening after the last hydrofoil has left, a taxi from Corfu Airport to Corfu New Port is included, but a private sea taxi is not (however, we would be happy to organise for you). In this case, the return leg from Gaios harbour on Paxos to Corfu Airport for your flight home is of course still included. Alati Bay View is situated just 6km (by road) north of Gaios, Paxos' main town and harbour, and about 4km south of Loggos. The property overlooks and has easy access from the garden gate to Alati beach, from which it takes its name. 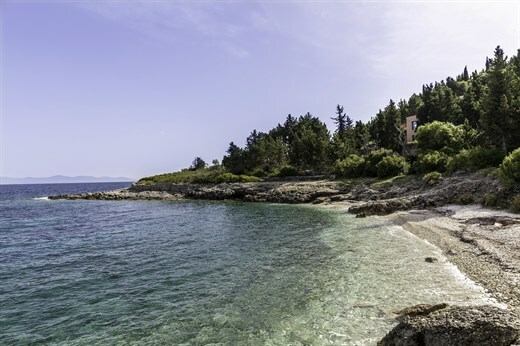 The beach is accessed by land only from Alati and one other villa. A short drive up or down the coastline will take you to a selection of other idyllic beaches. Its three main villages, Gaios, Lakka and Laggos, are picturesque, welcoming little ports with picturesque seafront tavernas, shops and bars. Gaios is the main port of entry and departure, and also has frequent boat services to Paxos' tiny sister island, Antipaxos. "Alati Bay is a beautiful villa in a unique setting. Amazing. The villa staff were all very friendly and helpful. The cook was outstanding." Alati Bay is a beautiful villa in a unique setting. Amazing. The villa staff were all very friendly and helpful. The cook was outstanding. Paxos is so beautiful.